I was a little stuck for the last drawing of Inktober - actually, that's not true, I had an excellent idea, but I decided against it because I feel the description in the book is more than good enough, and the last thing I want to do is cut off a reader's imagination. Faces are one thing - creatures and curses are another. So I decided to leave readers to their imagination, since that's one of the best parts of reading fantasy, and turned instead towards something simpler but still related to The Zi'veyn. Here we have little Aria, dressed up as a ditchling. 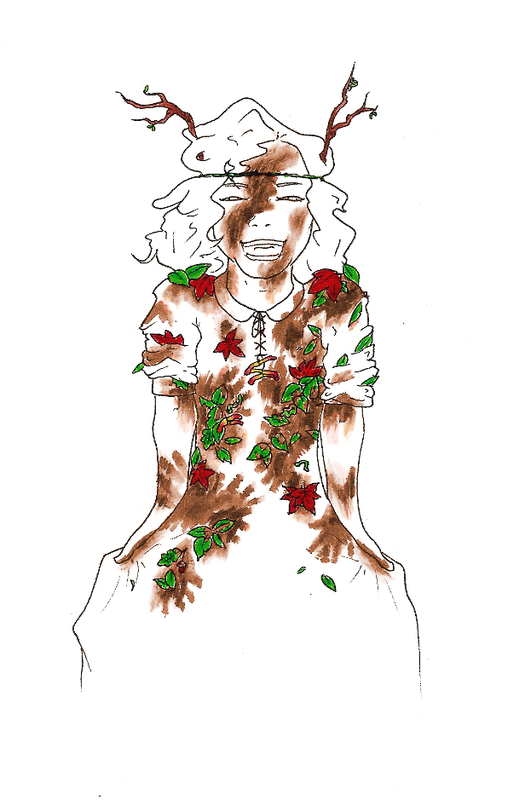 She's tied twigs to her head, smeared herself in mud, and stuck leaves all over her dress for camouflage. Seeg says it's a bit too busy, and I think he's probably right, but it's what I wanted and it's come out well enough. And I think it's appropriate enough for Halloween.